THE GOOD EARTH: Getting down and dirty for a worthy cause. On Friday, April 5, Prime Minister Portia Simpson-Miller officially broke ground for the construction of new accommodation, office and storage facilities at Lathbury Barracks at Up Park Camp in St. Andrew. In her address to the gathering, the PM said the commencement of the project in less than a year after its announcement is a demonstration of "a promise made and kept." Simpson-Miller also described the project as a fitting tribute to the work and worth of the brave men and women of the Jamaica Defence Force (JDF), while noting her delight that the work has started. Construction of the new facilities at Up Park Camp is estimated to cost some $1.68 billion and was made possible through the National Housing Trust (NHT). 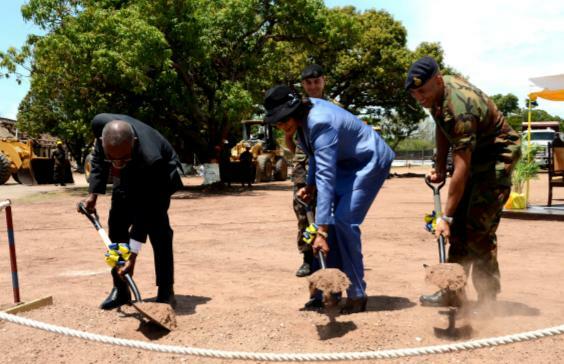 In the photo above, PM Simpson-Miller; Chief of Defence Staff, Major General Anthony Anderson (right); and Chairman of the National Housing Trust, Easton Douglas take part in the groundbreaking exercise. Also sharing in the occasion were Managing Director of the National Housing Trust, Cecile Watson; Permanent Secretary in the Office of the Prime Minister, Onika Miller; Commanding Officer of the 1 Engineer Regiment, Lt. Col Martin Rickman; and Minister of National Security, Peter Bunting.